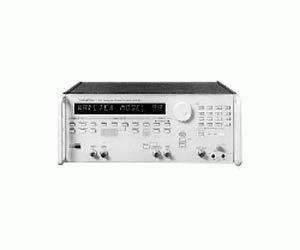 Wavetek (Fluke) 98 Low Distortion, Synthesized 1.1 MHz Oscillator Model 98 is a ruggedized, low distortion synthesized sine wave oscillator with up to 30 Vp-p output amplitude. Frequencies from 1 uHz to 1.1 MHz are generated using direct digital synthesis with eight-digit resolution and 30 ppm accuracy. An external 10 MHz reference can be used to synchronize the output to an external frequency standard for improved accuracy. Model 98 also has versatile frequency sweep capability, including continuous sweep, triggered sweep, sweep-and-hold, and sweep up/down functions. The Model 98 combination of accurate performance, user-friendly front panel, and standard GPIB interface make this the ideal product for precision bench-top and ATE applications. The sine wave can be selected for either 50 ohms unbalanced output or 600 ohms transformer-coupled output, which in turn may be connected as a balanced (with center tap) or unbalanced output. At 50 ohms output, the sine wave can be programmed from 15 mVp-p to 15 Vp-p into matching impedance (30 mVp-p to 30 Vp-p into high impedance) and is available across the full 1 uHz to 1.1 MHz frequency range. At 600 ohms output, the amplitude range is 15 mVp-p to 30 Vp-p across a 600 ohms termination, with the output frequency restricted to a range of 30 Hz to 200 kHz. At either output, the amplitude is correct as displayed assuming proper termination. Amplitude may be displayed as Vp-p, Vpk, Vrms or dBm. Model 98 has extensive built-in sweep capability providing linear and logarithmic sweep spacing with start and stop frequencies programmable from 1 Hz to 1.1 MHz in a single range. Sweep times are adjustable from 30 ms to 1000 sec.A horizontal sweep output signal is provided, as well as penlift and sweep-marker signals. The calibration interval is greater than, or equal to, 18 months due to the designed stability of Model 98.